Why go to all the trouble of juicing, when you can pick up the same thing in the store without all that work? Most people know that labels such as "fruit-flavored drink" or "contains real fruit juice" mean that the drink inside is probably mostly water and sugar. But now stores are full of bottles of healthy-looking "100% fruit" or "all-natural" juices that look like they were just squeezed from the fruit. The truth unfortunately is a little different. All store-bought juices start at the same place - as a fruit or vegetable growing in a field. But from here, they take a long path to that bottle in the shop. The first step is to a actually extract the juice from the fruit. This isn't a gentle process. These fruits and vegetables are put into an ultra-speed commercial centrifugal unit. This causes heat and oxidation, damaging their valuable phytonutrients. From there, most juices are pasteurized to allow them to be stored long periods. This involves "cooking" the juice for 45 minutes at 110 degrees. At this point, the juice is rendered sterile - free of impurities but also of most nutrients as well. But that's not all. Now the cooked juice is reduced to a concentrate - 80% of the water content is removed. This makes it much easier to store and ship. This concentrate is then combined with water and other juice concentrates according to the recipe involved. At this point, additional ingredients are put in including synthetic vitamins and minerals, sweeteners, colorings, and "flavor packs". Then this "juice" is put into a bottle or carton with a picture of healthy fresh produce. Even if you read the label, it's easy to be fooled because there will often be listed just fruit juices and "natural flavorings and colorings", along with an impressive list of vitamins (which were chemically added later). Not all store-bought juices are created equal. If you are going to buy juice from the store, the most important thing is to look carefully at the label. It is rare, but possible, to find bottled juices noted as "not pasteurized" and "not from concentrate". Even better, look for "organic" juice if you want to avoid possible pesticide residues. Some stores are now offering fresh-pressed juice with a shelf-life of a few days. Look for "cold-pressed" fresh juice, meaning it hasn't been processed in a high speed, high-temperature centrifuge. And check the date. Fresh juice deteriorates rapidly, and is best consumed the day it was made. Juice bars offer a far better solution for fresh juice. Some juice bars offer pre-bottled juice, but it is far better to take the extra time and order a juice prepared on the spot. This way you can be sure of the freshest juice with the highest level of nutrients. Also, take a look at what kind of juicer is being used. Unfortunately, high-speed centrifugal juicers are still by far the most common machines used in juice bars. These allow juice to be made very quickly, but the high speeds in excess of 10,000 rpm cause heating and rapid oxidation. Make sure to consume any juice from a centrifugal juicer immediately. 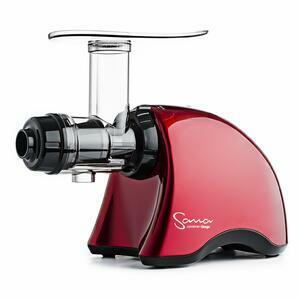 Fortunately, cold-press low-rpm commercial juicers are now beginning to appear on the market. If you find a juice bar using these kind of juicers (like the Kuvings Chef or Sana Horeca), you can be sure the juice will have the highest nutritional value and the best flavor. It also can be refrigerated up to 12 hours. By far the best way to get fresh juice is to make it at home using a slow juicer. This allows you to know exactly what is in the juice, and you can prepare it just when you need it for maximum taste and nutritional value. Home juicers have come a long way in the last 10 years, and modern cold-press vertical and horizontal juicers are easy to use and clean up quickly. This means you are far likely to juice often, especially if you use a modern juicer from a quality brand like Omega, Sana, or Kuvings. Click here for advice on how to choose the best juicer.